2 hours of private advanced training for licensed riders ($300). 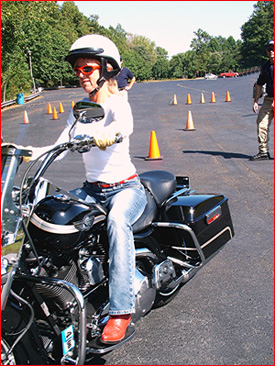 Imagine two hours of one-on-one time with a motorcycle training professional. You'll get expert instruction on exactly what you want to work on. If you don't know what you want to work on we will find what you need by interviewing you and then assessing your riding skill level. If you're just now starting your motorcycle riding life we can raise your skill level significantly through this personal learning time. We will work on what you want and need to work on. You'll get life-saving training and raise your confidence level. If you are an experienced rider there is always something you can learn to make you a better rider. We will assess your abilities and tailor the session just for you. You will leave this class a much better rider with a higher level of confidence in your abilities. We can schedule this course when you have the time. Weekdays or weekends - it's up to you. To schedule an assessment interview call 703-491-9102 or click here to leave us a message. We will connect you with one of our motorcycle training professionals to tailor the course to your needs and make the appointment. The cone patterns and braking exercises for me were my favorites because they tested my skill, stamina and mind. The patterns were practical and prepare you for riding on the street. The highlights of the course, were the instructors, who were very positive and calm. They were very knowledgeable and great riders without being showoffs. This helped me to do well in the cone patterns and braking exercises. I rate the course a 10 for most of the above reasons but these guys are motor cops who can back up what they teach with real life experiences and knowledge. I had a great time. Went out today with the department 2012 road king and was able to do the keyhole pattern with ease both right and left. Thanks, at least I can hold my own now with the four younger guys!